Under two weeks until Finding Dory swims into theaters. I am SO EXCITED you guys! Two (or three?) years ago when they announced it, and started showing teasers, I felt like this movie would never arrive….but here it is! Biggest bummer, I probably won’t get a chance to see it until July as we have a wedding out of town in June that we are also planning a vacation around. Sensory play is pretty awesome. I am kind of sad that the Goof just isn’t that into it anymore, and the twins are still a little young for it. But one thing the Goof does still enjoy are sensory bags. In fact, they are a good calm down tool for him when he is having a bit of anxiety, or is having a really bad day. 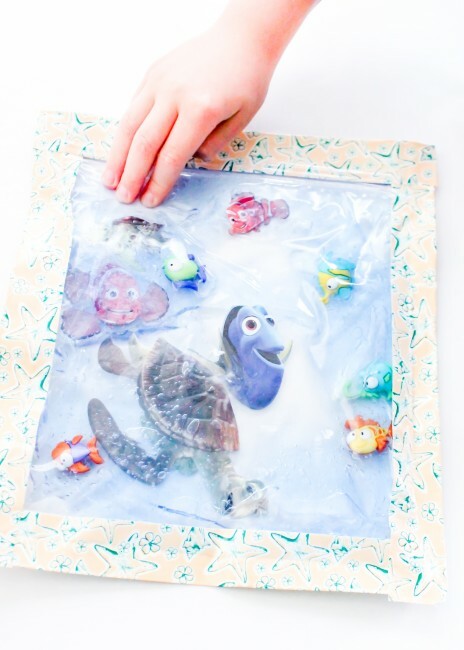 So, I thought it would be fun to make a Finding Dory sensory bag. These are really easy, and cheap to make. A quart or gallon size ziploc bag. Flat fish and Dory objects (I used rubber fish button attachments I found at Walmart, and Dory stickers) that can get wet. First, I used Finding Dory stickers that were 3d and had different textures. They definitely were not water proof so I used contact paper to laminate them. If you don’t want to spend the money on Dory stickers, you could probably find pictures online to print out of the characters and laminate them. I also got buttons that were kind of like rubber and tropical fish themed from Walmart. 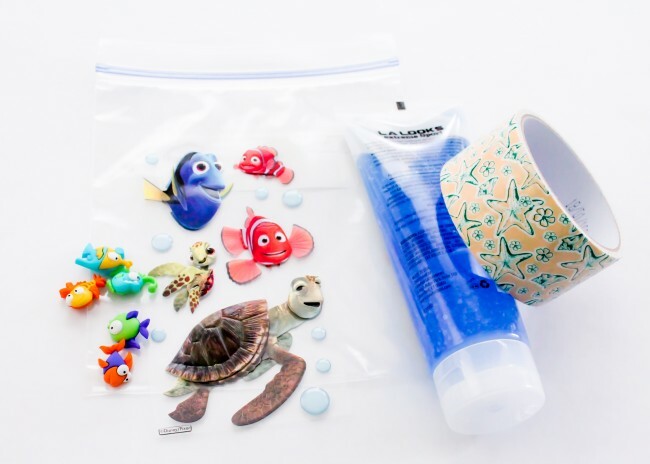 You could use other things like Dory themed erasers, etc. Just make sure they don’t have points and are relatively flat. 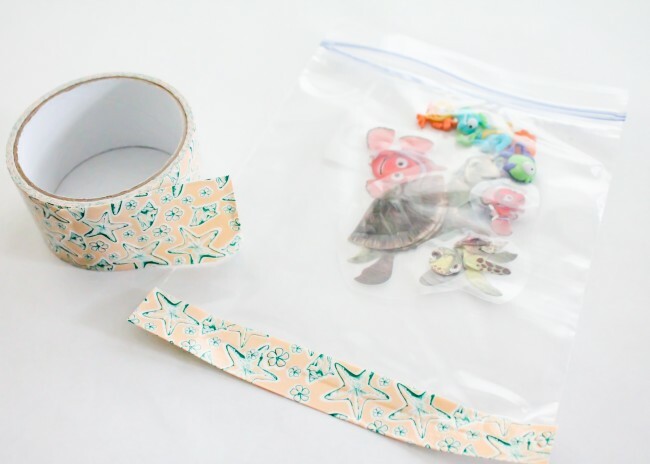 Next, you need to take your ziploc bag and put the duct tape on the 2-3 sides that do not have the ziploc on it. This is simply to reinforce the seams to make sure it won’t leak. You could wait to do this until the end, but I found it easier to do two sides (bottom and one side) then continue to next step and finish the duct tape at the end. I couldn’t find any Dory duct tape, but my local dollar store had a beach themed one that worked perfectly. I also placed my items in the bag while I taped it to make sure the bag I chose was big enough (I used a quart sized bag). Once you have 2-3 sides taped, take your blue hair gel and add it in to the bag. I found one tube was the perfect amount for a quart size bag, so if you want a gallon bag, you might need two. If your local dollar store doesn’t have it in blue, you can also just get clear and add blue food coloring. 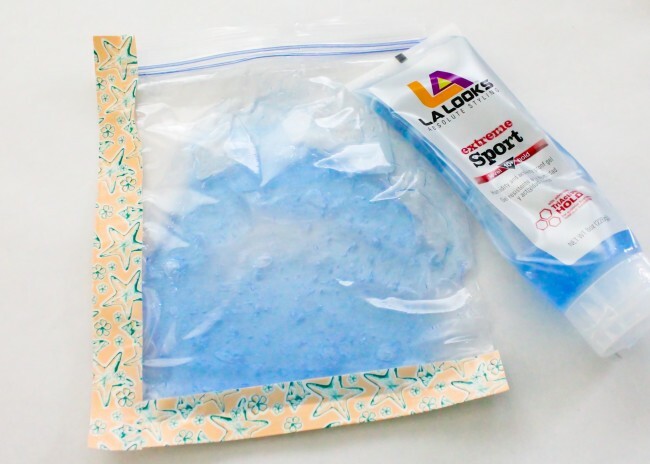 After you add your hair gel (and food coloring if needed) simply put your items in the bag and move them around a bit so they aren’t all clumped in one spot. Then ziploc your bag, and finish duct taping all the sides. 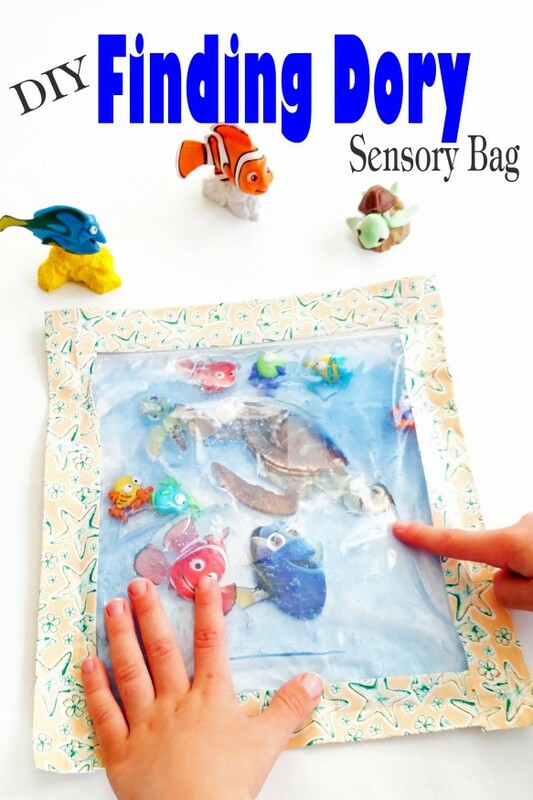 We sometimes tape our sensory bags to the Goof’s bedroom window, but he actually really likes having this one on his play table in his room. He has really enjoyed it, even when he didn’t need to calm down and has probably spent a few hours each day playing with it. It is the simple joys in life. How fun! I even thought about sand and seashells, but couldn’t find any locally that were flatter (seashells) and small enough. Let me know how it turns out for them. This was so smart- I love the idea. What a cute (and easy!) project.